Worth Halt on the Lavender line or a circular walk returning to the start point. Isfield was originally a small hamlet clustered near the river Uck and the church. When the railway came its centre moved nearer the station. This walk looks at both parts of Isfield. There are various options on this route, which allow you to walk anything from 1.5 to 4 miles. Trains run on the Lavender Line most Sundays throughout the year and you can use this to shorten the walk. There are toilets at Isfield Station and the Laughing Fish for customers. You can get food at both these places. 2) At the second bend you will see a concrete track coming in from the left. Just to the right of this (sometimes obscured by the hedge) is a metal footpath gate. Go through this and walk east north east across the field. Soon you meet a hedge. Continue to the right of this into the next field. In this field walk east along the edge of the field to reach the main road. Turn left here along the pavement. 3) Soon come to a small paved lane on your left, in a wood with a sign to Worth Farm. Turn down this lane and walk for about 400 metres down it. 4) The woods end and you come to a bend with a gap in the hedge. Go past this, and after 20 metres or so more, come to another gap in the hedge on the left (opposite a broken footpath sign) The path is not always clear across this field. You want to go west, walking at roughly 90% from the road If in doubt walk straight across the field until you come to the railway. 5) Cross the railway carefully. If you want to visit Worth halt or ride on the train turn left on a path right beside the track and fenced off from it. You can see the halt ahead of you. Worth Halt (second picture) was built by railway volunteers in just seven months in 2012. You can just sit here and pretend that you are back in Victorian times sitting at a rural halt waiting for a train to London and taking in the sights and sounds of the countryside. When train services are running there are trains from here at 15 and 45 minutes past the hour. So you can finish your walk here and take the train back to the start. It is unusual for people to board the train at Worth halt so you will probably have the place to yourselves while waiting. You can see the train coming (slowly) from a long way off. Children may be delighted at the fantasy that the the train is coming just for them. 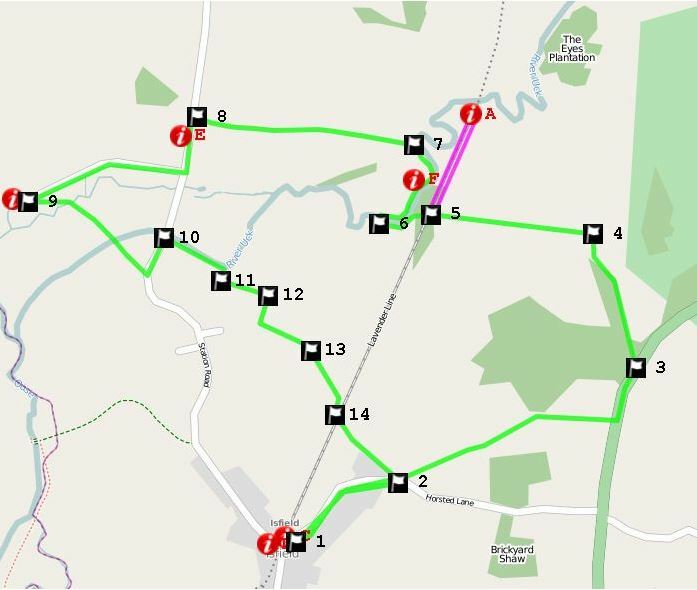 Alternatively you could catch the train from Isfield and get off at Worth halt to Start your walk. Trains leave Isfield on the hour and half hour when they are running. If you have come from the walk turn right when you reach the point where a footpath crosses the railway. If you did not visit Worth halt keep straight ahead after crossing the line. Walk through a small wood, and turn left over a stile into a field. You are now walking alongside the river, although it is difficult to see it. 6) Walk along the edge of a field until you see a footpath junction sign and a bridge over the river to your right. (Easy to miss). Cross the bridge and turn immediately right again alongside the river, on the edge of a field. Anywhere along here might be a good place for a break and a snack. 7) When you reach the end of the field turn left (west) through a thin field and then keep more or less straight ahead along a track. About 300 metres along this track look for a stile on your left. Go over this and then diagonally across a field, aiming for a wood to your left. The path enters the wood at a stile and then passes north of a house to meet the road. 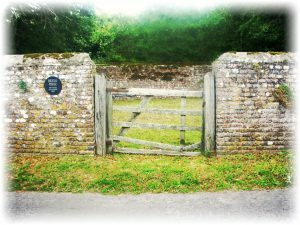 8) At the road turn left and walk for about 200 metres past Isfield pound (third picture) and then turn right on a very small road to Isfield church. Walk down to the church. 9) Just before the church you will see a path to the left which turns almost back the way you came and heads for a bridge. Take this path, cross two bridges and emerge back on the road again. Turn left on the road. 10) After about 50 metres you will see a footpath on your right, with a V shaped stile. Turn right down this path, which runs beside a stream. The end of this path can become slightly overgrown with nettles and other vegetation in high summer, but there is no chance of getting lost. 11) You emerge from this path by turning right just before a house, squeezing by a metal gate. Walk south down the track leading to the house, but after about 10 metres turn left through a door in the fence Follow the path ahead, which is enclosed at first but then opens out to a concrete track. Keep straight ahead. 12) You reach the outbuildings of Tile Barn Farm. Turn right here immediately before the building and head for a stile. Cross this and turn left along a path which runs along the side of fields. 13) The path then turns slightly right and runs diagonally across a field. The way is clear on the ground. It continues straight ahead through a thick wood. At the far edge of the wood, next to the railway, the route turns right. 14) About 200 metres later it turns left to cross the railway at an over bridge and then continues straight ahead to the edge of a field. Continue straight ahead at the end of the field. The path becomes enclosed. You emerge at point 2. Turn sharp right to walk back to the start point. The Lavender Line is named after a local coal merchant who once had a business based at the station. 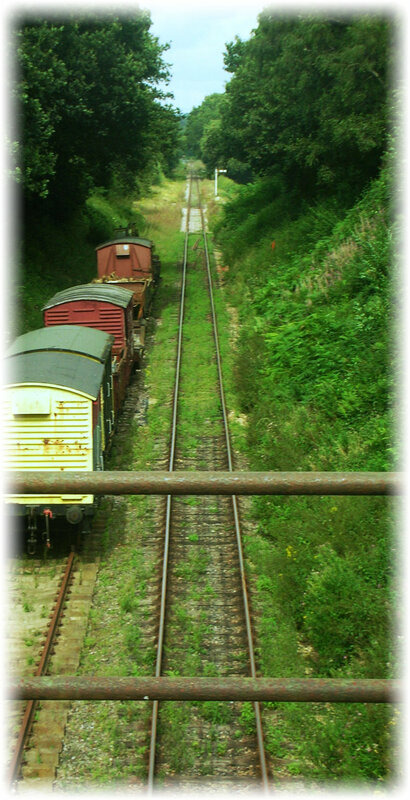 It was part of the railway route that ran from Lewes to Tunbridge Wells. Trains run most Sundays throughout the year and on a few other days at peak times. Opening hours are 11-4.30 on running days. 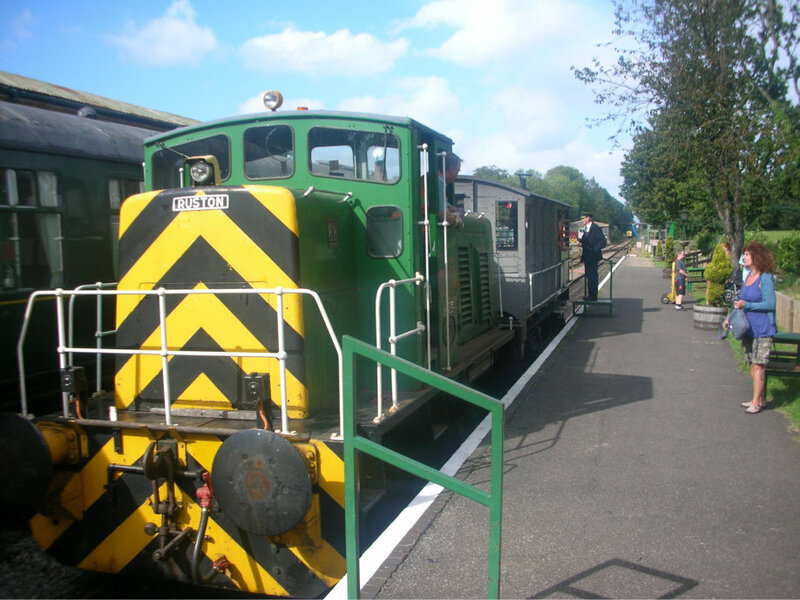 Most Saturdays it is possible to look at Isfield stations, although there are no public trains. Even when trains are not running you can see quite a bit of the line on the walk. This is one of the more intimate and informal heritage lines and you will not be swamped by the crowds as you may be on other lines. The Laughing Fish pub next to Isfield Station has a good reputation, real ales, food, a garden and a small children’s playground.